Have you experienced Westcoast Mountain Campers? Help others learn about this company by sharing your first-hand information with other road-trippers. 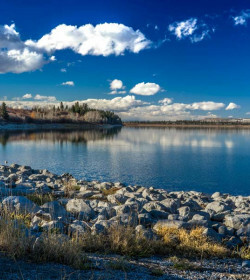 Wander around the Okanagan Valley up to the Canadian Rockies with a motorhome, a van conversion, or a truck camper from Westcoast Mountain Campers. 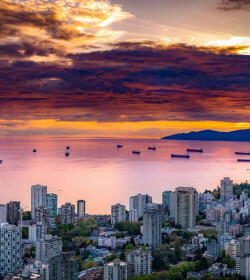 With depots in Vancouver and Calgary, this more than 30-decade-old rental company can give you a nice summer getaway or a simple weekend treat. 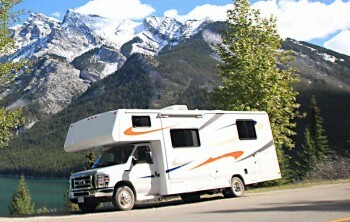 Westcoast Mountain Campers offers quality rentals of motorhomes, truck campers, and van conversions in different locations across Canada. Their depots in Vancouver and Calgary are well positioned, plus they provide airport and airport hotels transfers. They allow travel to the USA at an additional fee of $10.00 per night and one-way rentals from Calgary to Vancouver, and vice versa. To give you a great deal of savings, the company offers special rates at airport hotels. Because of their wide range of quality recreational vehicles, they give renters the option of their preferred vehicle size. With a rental background of more than 30 years, they take pride with a diverse staff that can communicate in different languages. Westcoast Mountain Campers has different RVs for different renters, from casual campers to luxury motorhomes to rugged truck campers. So, whether you are an adventurous couple, a mid-sized family, or with a large group of friends, there’s something that will match your preferred size and unit layout. All units come with free highway maps as well as campground guides, but you need to bring your own booster seat for your child. They rent out baby seats, lawn chair, GPS, bike racks, and the like for everyone’s convenience. The Super Van Conversion or the SVC is a compact motorhome ideal for a family bringing two kids or even for couples looking for a spacious holiday. The unit has one full wall slide-out and is tailored with a Ford E450 chassis and a 6.8 litre V-10 Triton fuel-injected gas engine to conquer some rocky terrains. Sleeping places inside include the rear queen-sized bed and big dinette convertible into a single bed. Aside from the cabinets and closets, there’s exterior storage for your extra stuff. A luxury Class C with one slide at the dinette area, the Deluxe Maxi is an automatic transmission, Hi-torque Ford 6.8 litre with V-10 fuel-injected gas engine. This high-end motorhome brings luxury accommodation on board with a private rear bedroom, a full bathroom, and a spacious kitchen. The unit can sleep 5 adults of up to 4 adults with 2 kids. This mid-sized motorhome is a 5 berth unit that extends up to 6. 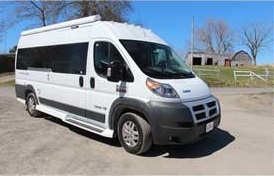 Tagged as a luxury RV featuring same vehicle chassis and engine as the Super Van Conversion. The unit got one slide-out at the convertible dinette. 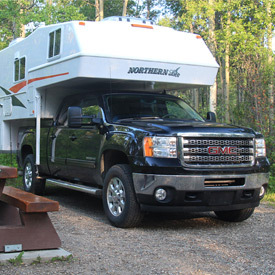 Compared to usual motorhomes with one cab-over queen, this family RV brings two single cab-over beds. 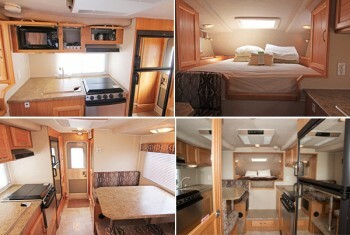 So, you have lots of options aside from the rear queen bed to the dinette bed and even the overhead beds. The perfect treat for touring couples, this 21’ Pleasure-Way Van Conversion is a beautiful and powerful RV, either in Dodge Sprinter or Ford E350 chassis. A 4-speed automatic transmission, the unit is furnished with AM/FM CD Player that comes with 4 speakers, a large refrigerator, a water heater, 2-burner stove, and microwave oven. The capacious rear lounge becomes a large double bed at night. A unique campervan for the adventurous hearts, this truck and camper or the TCA provides you two options—either diesel or gas powered unit. This converted late model quad is now tailored with luxury features, including a fancy kitchen with 3-burner stove, microwave oven, stainless steel sink, and 5-cubic foot fridge. The unit is suitable for couples with one child, with sleeping areas in the over-cab and dinette. The queen-size bed is oozing with headroom for comfier sleep as well as windows for proper ventilation. Renting a unit from Westcoast Mountain Camper includes $5-million public liability as well as property damage. The company requires a deposit ranging from $750.00 to $1500.00, with different maximum charges per accident. The security deposit is payable through major credit cards. Make sure to use the right fuel or else you’ll be charged with a whopping $8500. 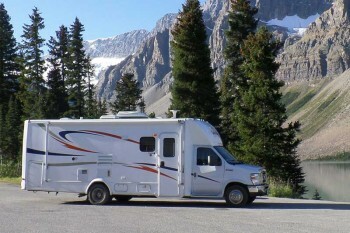 Westcoast Mountain Camper is one of the relatively known RV rental companies in Canada, with branches in Vancouver and Calgary. Having a diverse fleet of campervans in different sizes and styles, the company provides an in-depth selection for couples, small families and big groups. But of course, do not expect for brand new models. 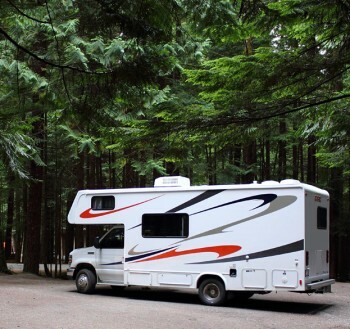 Whether you’re looking for a deluxe motorhome for two or a compact RV for your entire family, Westcoast Mountain can provide you with a decent unit from their large rental range of RVs. 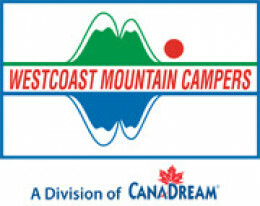 Have you experienced Westcoast Mountain Campers?